I am sitting on the back step of my cabin. A shaft of warm sunlight filters through and splashes my foot. In my right hand, I hold a broad sprig of elderflower and with my left, I am plucking the dainty scented petals into a wooden bowl. The memory makes my heart swell, not just because I can feel the peace of that moment, but because behind it in my mind, are a queue of summer-flavoured images and sounds. My grandmother made this sweet, barely alcoholic drink every year and in my favourite scenes, we are sitting in her beloved garden on faded deckchairs, sipping until we are ever so slightly tipsy. The recipe I am using is her recipe. 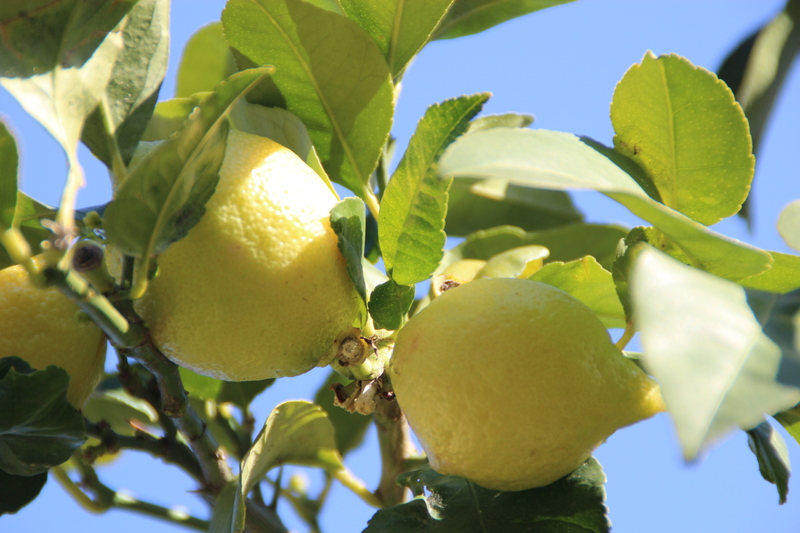 It was given to me by my Auntie Joan, long after my grandmother had died, and every summer I kept the ritual of sitting and plucking, before stirring in sugar, lemons and a touch of cider vinegar. My friends were wary of my gifts of elderflower champagne. Too often the bottles, expanding through natural fermentation beyond the limits of their fragile glass confines, exploded. The moment of explosion was scary enough but the aftermath – that sticky mess on walls, ceiling and floor, was sometimes more than pleasure of the remaining, intact bottle was worth. This year, I’m sharing the recipe with the community at Can Masdeu, this anarchist community that has become my haven. The large eldest tree in their courtyard has more than enough flowers. The community likes to dry them for a medicinal tea – a vitamin C-filled curative for coughs and colds. We pick the full blossoms and sit together in the Barcelona spring sunshine, plucking, then stirring, and later tasting. 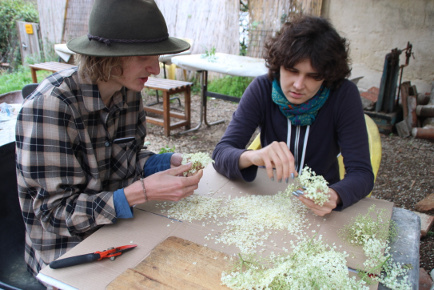 If it’s not too late, head out into the woods, find some elderflower heads and brew your own. But be careful of the explosions! 1. Sterilise all your equipment. I like to use a few drops of tea tree oil in plenty of water, but it needs a while to air ‘cos it can be a bit smelly. Pluck the flowers from your elderflowers. 2. Dissolve sugar in 1 litre of hot water in a fermenting bucket, then top up with 3 litres cold water. Allow to cool. 3. Add elderflower flowers, lemon juice and zest and vinegar. The elderflowers contain a natural yeast, so you shouldn’t need to add extra. (see below). Leave to ferment. 4. If you did not add yeast and fermentation has not started after 3 days, add a packet of Champagne yeast to get it going. 5. After 6 days of fermentation, strain through boiled muslin into a fresh fermenting bucket, leaving the lees behind. Cover the bucket and leave for a few hours for the dust to settle, then siphon into your bottles of choice. This time I used plastic bottles, for damage limitation, and it worked quite well. We were also able to release a little excess pressure by easing the lids off a little (careful!). Your champagne is ready to drink after a week. Enjoy! Place in a fridge or cool place to stop the yeast making any more carbon dioxide and drink. It should keep for up to 3 months, but you may not be able to leave it alone that long! If the whole popping thing is too scary, try this instead! (Also my grandmother’s recipe). Make syrup by dissolving sugar in water. And simmer for 5 mins. Pour into deep bowl add citric acid stir. Putin remaining ingredients. Stir well. Cover and leave 4 days stir night and morning. Strain into sterile bottle and keep in cool dark cupboard. Oh my goodness, you’ve hit a jackpot! My dear grandmother used to make this every summer. We kids used to relish it. She has passed away many years ago and for some reason no one knows what I’m talking about so I suspect that no one recorded her method. Until now. Ha ha. I can’t wait to plant an elderflower somewhere and restart the tradition…..and I almost gave up and got into gingerbeer. Well, both are good. Do you think there is a way to make it without sugar? Amazing drink. I don’t believe this. I will tell this elderflower champagne recipe to my mom.